Why do I have hair loss? The most common cause of hair loss is genetics and it is random. In other words, a person , male or female, could inherit the hair loss gene while no one else in their immediate family has it. Men are often told that they will have the hair loss pattern of their mother’s father. That is a good rule of thumb but not definite. Often men have hair loss while their brothers do not. For women hair loss is more rare but is often genetic. There are other causes of hair loss in both men and women – stress, bad hair products, reaction to medication, medical conditions. Dr. Behnam examines all possibilities with each patient to prescribe the best solution. If I get a hair transplant procedure, will I have to have another one? This depends on the amount of hair loss you have, the size of the procedure you have and your future hair loss. For example a person who has no hair on the top of their head but good donor hair on the sides and back may need two maximum graft strip procedures. One to cover the front and one for the back. Another patient who only has hair loss in the front may only need one procedure. If that patient never loses the hair in their crown, They my never need another. If either of those patients do f.u.e. procedures, they may need more because the yield per day is less. In the free consultation, Dr. Behnam will explain what is needed. Is my hair loss related to my diet? It is rare that what you are consuming is causing hair loss. However, recent studies have shown that certain supplements can contribute to hair loss. Whey protein isolate (not concentrate), arginine, leucine and other supplements have been found to contribute to hair loss. The specifics of the most recent research is discussed in the free hair loss exam with Dr. Behnam. No, there is no proof or any scientific research that suggests that wearing a hat can cause hair loss. Can wearing my hair in a pony tail cause hair loss? Yes, frequent tight pony tails can cause traction alopecia which is an inflammation under the skin. Areas with this inflammation will not grow hair. If I have traction alopecia, what do I have to do to treat it and grow hair in that area again? First the inflammation must be treated and often a biopsy is required to identify if the inflammation exists. If the area is inflamed, it can be treated with steroid injections usually over a six month period. Sometimes the hair grows back when the inflammation is eliminated. Other times a transplant is required to restore hair when the inflammation is eliminated. In some rare cases, the injections do not work and nothing can be done to restore the hair. What is alopecia areata and how can it be treated? It is a condition in which hair is lost from some or all areas of the body, usually from the scalp and usually in a circular pattern. It can be treated with steroid injections. Can coloring my hair cause hair loss? Frequent coloring, especially extreme coloring that is more than two shades different than the natural color can damage and cause hair to loose its volume. I straighten my hair, can that cause hair loss? Yes, the high temperature devices that are used to straighten hair can cause it to lose volume over time and break easily. If I get a hair transplant will I still have to use medication to maintain my hair? The transplanted hair will not need medication or topical solutions. Patients who still have a lot of non-transplanted hair may want to take medication or use topical solutions to maintain the hair that has not been transplanted. After the surgery, when will I be able to go back to work? On average, most patients go back to work after four days. Some patients who work in an office environment may go back to work the next day after the procedure. Patients who have more physical requirements at work will need to take more time off. Also, the time off can be contingent on how much non transplanted hair the patient has and how private a patient is. There may be some redness in the transplanted area, usually looking like a slight sunburn or irritation. Seven days may be required for those who do not want to return to work while having redness. Redness varies from patient to patient and in some cases redness lasts longer than 7 days. Down time will also be discussed in the free consultation. How do I know if I am a candidate for hair transplant? Amount of hair loss- Often, patients want a hair transplant procedure before there is room to put more hair. Though the hair has thinned, it has not thinned enough to warrant surgery. These patients are advised to try other remedies to thicken the hair. Often these patients can avoid ever needing a transplant. Current stage of their hair loss- patients who are experiencing rapid hair loss should not have a procedure until the shedding has stopped. The quality of the donor hair – Patients who have thinning in the donor area should not have hair transplants. Thinning in the donor area indicates that the donor hair is susceptible to the hormones that attack hair. If transplanted, the hair may not grow or fall out in the future. Dr. Behnam examines donor hair of every patient before scheduling a procedure. I work out a lot. Will I have to stop working out for the procedure? How long? After the hair transplant procedure, the area where the grafts were implanted should not sweat for seven days. Patients who are runners should not run for seven days. Patients who workout with weights should not lift heavy for two weeks after the procedure. Very little if any. Patients are always surprised at how comfortable they were during the procedure. Dr. Sean is committed to doing whatever it takes to make each patient as comfortable as possible. For patient experience testimonies please read our reviews at insiderpages, doctorbase, vitals, yahoo reviews, google reviews, and yelp. Are there additional fees for the post op. kit, medication, or follow-up visits? No, all medication,the post-op kit, and all follow up visits are included. You may wash your hair the next day after your procedure but Dr. Sean will give you specific instructions on how it should be washed. If I am from out of town, is a hotel included? If a patient lives over a hundred miles away from our clinic and stays for 2 nights, we will pay for one of those nights at the Comfort Inn next door to our clinic. Patients who have 2 days of F.U.E. usually stay four nights. For those patients, we pay for two nights. We get a 20% discount so we make the reservations (upon patient’s request) and add the patients portion to the final bill. Do I have to shave my head to have a hair transplant? Patients do not have to shave their entire head but F.U.E. patients will have to shave the donor area which sometimes can be a large portion of the back of the scalp. For strip patients, only the portion of the donor area that will be removed will be shaved. Is it possible to clone hair? At this time, cloning is not a viable option for hair restoration. There is continuous research being conducted and scientist do believe that one day cloning may be possible. Some have claimed that Acell could possibly clone hair. Dr. Behnam has experimented with Acell for over three years and has seen no cloning. What is Acell and what is it used for? It has been discovered that the bladder regenerates. Acell is made from the lining of a pig’s bladder. When the tissue is stripped down to the cells, there is no DNA so any organism will accept it. It acts as a scaffolding for rebuilding tissue through blood vessel formation. When the blood vessels form, the surrounding tissue regenerates. In hair transplant procedures it can be injected into the scalp where hair is transplanted to accelerate healing and growth. For f.u.e. patients, Acell can be used in the donor to reduce individual extraction sites up to 40%. Acell is also injected into the scalp with platelet rich plasma (p.r.p) to stop rapid shedding. For a complete history of Acell please see Acell.com. What is P.R.P (platelet rich plasma) and what is it used for? The a small amount of patient’s blood is drawn and spun in a centrifuge. This separates the blood so that the platelet rich plasma can be extracted and injected into the scalp where hair is thinning or shedding. This gives the area millions of growth platelets to revive the hair in that area. Dr. Sean has used this process for thinning and shedding and has found it to be more successful in stopping shedding than reversing thinning. Will my insurance pay for my hair transplant? We have found no insurance plan that will cover the cost of a hair transplant. We do have interest free financing and we continuously evaluate our prices to ensure that our procedures are affordable. Can my spouse donate hair to be transplanted on my head? Each hair follicle is an organ. Currently, transplanted hair can not be donated from one patient to another. The hair would be rejected and not grow if it were to come from another person. Patients are given a local anesthetic and awake during the procedure. Is it possible to lower my hair line? Yes, hairline lowering for men and women is a procedure that Dr. Behnam does often. Is it possible to transplant hair from other body parts like my back or chest? It is possible. 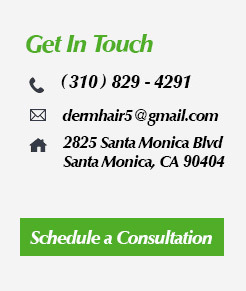 Dr. Behnam recommends using the hair from the back of the scalp rather than body hair. The hair from the back of the head is better suited to be placed on the head and it is easier to get more hair than extracting it from parts of the body. Body hair should be used only as a last resort when there is not adequate donor hair on the head.